UVic’s annual Alumni Week is back, and Fine Arts is well-represented in the various events happening across campus and around the city from February 1-7. 2018 marks the 11th annual celebration highlighting the achievements and impact of our alumni, and offers everyone — current students, faculty and alumni alike — the opportunity to show our UVic pride and celebrate UVic grads in communities all over the world. While there are over 15 events and activities happening over the week, we’re only going to highlight those involving Fine Arts alumni. And be sure to check out the Flashback Foto Contest, where you can submit photos of yourself from your UVic days and enter to win prizes. 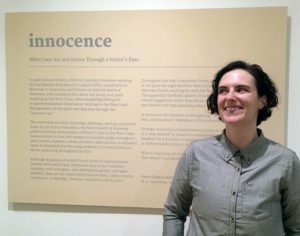 At 3pm on Saturday, February 3, Art HIstory & Visual Studies alumna and current AHVS graduate student Nellie Lamb will be hosting a special curator’s tour of her current exhibit, Innocence: West Coast Art & Artists Through a Visitor’s Eyes at UVic’s Legacy Art Gallery Downtown. A fascinating look at west coast creativity in the early 1960s, Innocence pairs original works from UVic’s Art Collection with a 1963 NFB documentary. “Sometimes seeing something we are familiar with through another’s eyes reminds us how incredible that thing is,” she explains. “I hope visitors leave the gallery with a feeling of wonder about the place that we live, and the artists who have worked here for thousands of years and continue to . . . . that’s the feeling in [both the film] and the artworks in this exhibition give me.” You can read more about Lamb’s Innocence exhibit here. The main event of the week, the gala Distinguished Alumni Awards Night, begins at 7:30pm Monday, February 5, at the Songhees Wellness Centre. All are welcome to attend this free event and see 12 distinguished alumni honoured, and hear what they have to say about how UVic has made — and continues to make — a difference in their lives, and the greater communities around us. 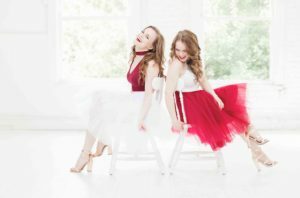 Among the recipients are the Faculty of Fine Arts DAA recipients, Carli and Julie Kennedy — School of Music alumni who, under the stage name Twin Kennedy, have been shaking up the world of country & roots music from their new base in Nashville. “There’s a lot of people in Nashville who can’t do what we can, because they never went to school,” says Carli. “We’re so grateful to have had the time to study and learn before we got out there.” Read more about Carli & Julie in this exclusive interview. Celebrated Writing alumnus Daniel Sieberg will be In Conversation with UVic Chancellor Shelagh Rogers starting at 7pm on Tuesday, February 6, at First Metropolitan United Church. 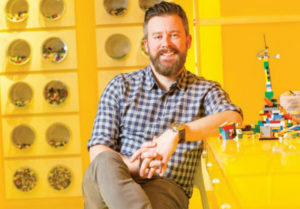 Not only is Sieberg a graduate of the Writing department but he’s an Emmy-nominated and award-winning TV correspondent/host and the author of The Digital Diet, as well as a former Google executive and the co-founder of Civil. The big event on Wednesday, February 7, is the special free concert by Twin Kennedy starting at 8pm at Felicita’s Campus Pub. Enjoy a rare intimate and acoustic local performance by these Canadiana stars, who are a little bit country and a little bit classical. With a steadily growing amount of industry recognition — including multiple nominations from the Canadian Country Music Association (three) and the BC Country Music Association (12) — Twin Kennedy have also already won two John Lennon Songwriting awards for their song “Secondhand Gold,” which picked up the Grand Prize (Country) in 2015 and Best Country Song in 2016, as well as a pair of Vancouver Island Music Awards (Country Album of the Year). Also running all week (and through to March 29, actually) is the exhibit Distinctly Canadian: The Malahat Review’s Relationship with the Visual Arts at the Legacy Maltwood Gallery in the McPherson Library – Mearns Centre for Learning. 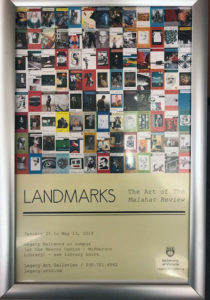 Curated by AHVS alumna Caroline Riedel, this exhibition pays tribute to the role of art in The Malahat Review — one of Canada’s most iconic and long-standing literary journals. In its50-year run, its pages have featured the work of established writers, emerging talent and critical essays on both literature and the visual arts. The synergy between art and literature is particularly evident in the cover art and essays of the journal’s first decade, which presented new work by internationally acclaimed artists such as Henry Moore, Barbara Hepworth, Andy Warhol, and Roy Lichtenstein. Featured artists in this exhibit include Maxwell Bates, Robert De Castro, Glenn Howarth, P.K. Irwin, Davidee Kavik, Jack Kidder, Tony Hunt Sr., Elza Mayhew, Eric Metcalfe, Myfanwy Pavelic, Margaret Peterson, Bill Reid, and Gordon A. Smith. For a complete listing of Alumni Week events please visit our Attend an Event page for more details. If you have any questions please contact Alumni Relations at 250-721-6000 or alumni@uvic.ca.